This entry was posted in Pioneer Obituaries and tagged Cowell, Daffy, Kelly, Kirkwood, Moffatt, Moodie, Murray, O'May, Sloan, Wombwell. Bookmark the permalink. in turn produced my father, Lanny. I would love to find a photo of James and Emily and any of their other decendents. Is there a local historical society in Mortlake that you are aware of that may have something of interest to me? I came across your entry on Susan Sloan. Susan is my GGM and her maiden name was indeed Sloan. Susan Sloan (b. Glasgow, Scotland) married Thomas Sloan (b. Dungannon, Ireland) in Susan’s bridesmaid’s tent on the goldfields of Cathcart near Ararat. 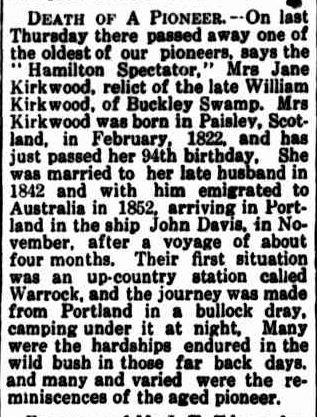 She arrived in Portland on the ship Utopia in 1854 accompanied by her elder brother and sister Thomas and Mary. Her father Francis and mother Mary arrived about a year later in 1855 on the ship Derry Castle together with her younger brothers Francis and Phillip. Unfortunately her infant sister Flora died on the voyage. Thomas Sloan arrived in Portland in 1852 with his parents Robert and Mary and his three brothers and two sisters. 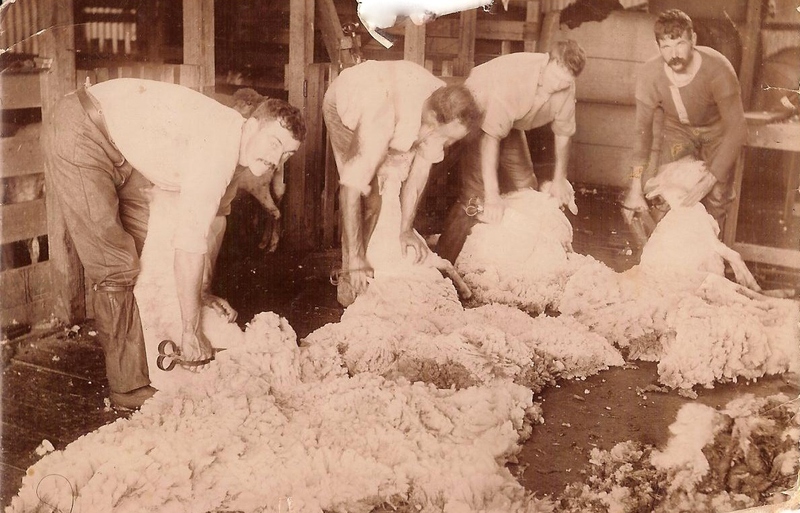 For a time Thomas worked for his grandfather Thomas Sloane who came to Australia in 1842 and was a farmer near Tower Hill. 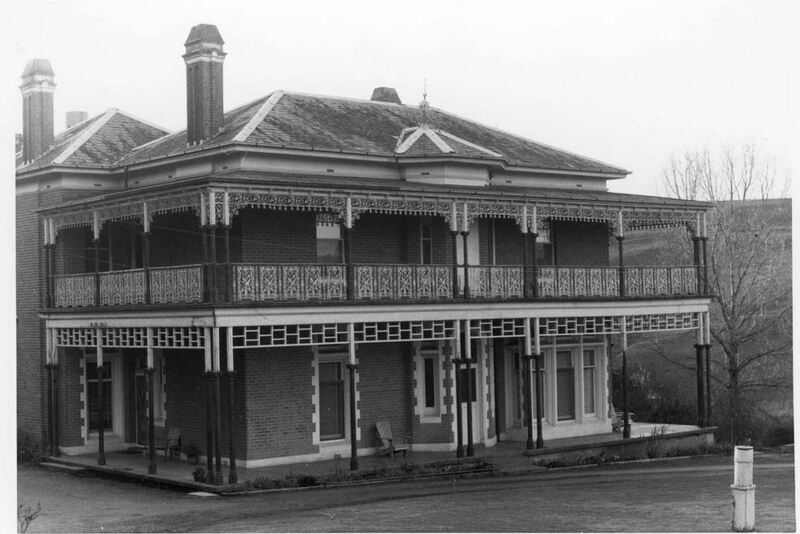 Thomas then went to the goldfields with his brothers where he met and married Susan. After their marriage they lived in various gold areas before settling in Portland. During their time there they operated the White Horse Brewery, bakery and cordial factory. 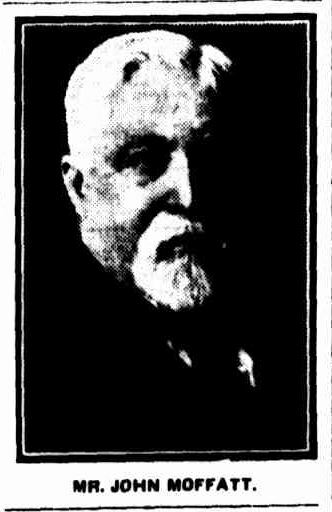 Thomas was also a Portland Borough Councillor. About 1873 the family moved to Hamilton where they initially leased the Grange Brewery and later operated the North Hamilton Steam Brewery and cordial factory. I believe the brewery was behind the cottage in Pope St and the cordial factory was in Cox St.
During their life together Thomas and Susan had 11 children, 5 sons and 6 daughters.